When it comes to sharpening colored pencils, you have three primary options available to you – manual sharpener, sanding block, and an electric pencil sharpener. Each of these options carries with it its own unique set of advantages and disadvantages. While it was only a few short years ago that your colored pencils were never advised to be used on your electric pencil sharpener, times and technology has changed. Today’s best electric pencil sharpeners for colored pencils not only have easy to clean razors, but offer sharp replacement razors, portability, along with tip adjustment levers, making for consistent and reliable results every time to go to sharpen your pencil. As you will quickly see, electric pencil sharpeners can vary quite a bit when it comes to their price range. Based on all the brands that we looked at when researching for this article, we found that the price range went from $15 to $42. As you will see in just a minute, what you get for $15 will vary greatly when compared to all the bells and whistles in the $42 offering. 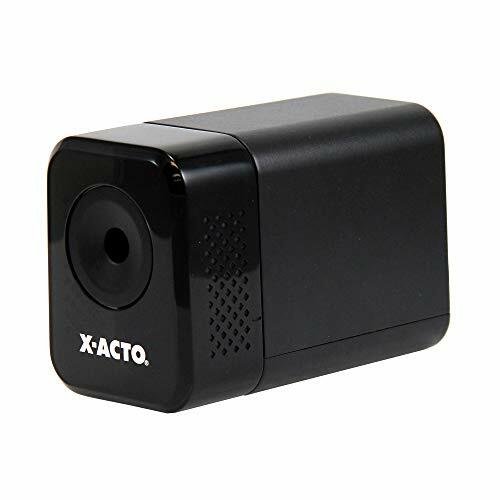 Our recommendation here is that you should expect to spend roughly $25 for a decent electric pencil sharpener that won’t chew up or destroy your colored pencils (which of course will cost quite a bit more over the long run). Depending on the use of the electric pencil sharpener you may want to consider replaceable blades. The way that electric pencil sharpeners are design, there is no physical way to remove the blades and sharpen them manually – instead, you will typically have to go to the company’s website and order your replacement blades directly. If you are just planning on using the electric sharpener for personal use, then replacement blades likely won’t be a big deal as the initial set of blades should last you for several years. However, if the electric sharpener is to be used in an art class, then a more industrial offering like the Bostitch QuietSharp Glow will be much better, especially given the fact that replacement blades cost under $10 according to the Bostitch website. 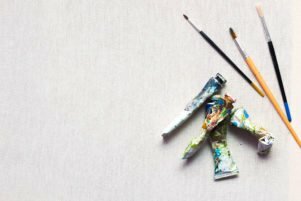 Some artists love to draw at a local coffee joint, on a nature trail, or wherever life takes them. No matter the scenario, should you plan on traveling with your colored pencils and be needing a sharpener, then you will want to get an electric sharpener that is battery powered. Typically relying on AA batteries, these compact (and quiet) sharpeners can quickly form a fine tip point on your colored pencil – which is great should you be drawing wildlife. On the other hand, if you plan on never drawing outside the studio, then a simple corded one like the X-ACTO XLR will be more than sufficient. So, take a minute to think about how you will be using the sharpener before you buy. 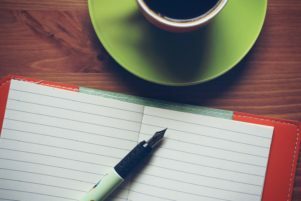 While the focus of today’s article is solely around the use of electric sharpeners for colored pencils, we respect the fact that many of you reading this likely prefer to go between different mediums when it comes to making art. We talked about the Bostitch QuietSharp Glow in our recent review of the best sharpeners for colored pencils – and it won the award for overall best electric sharpener. It simply had everything that a professional artist could want in their electric sharpener. A super quiet motor, made for industrial applications, and has a blade that can be easily replaced (and for about $10 to boot!). 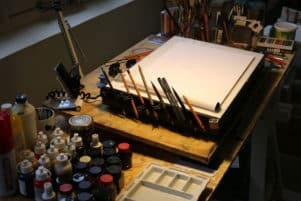 Sure, it might not have all the whizbang features of the EX-20 and OfficeGoods sharpeners – but that’s for the artists who are still traveling between art classes or like to go outdoors and draw. 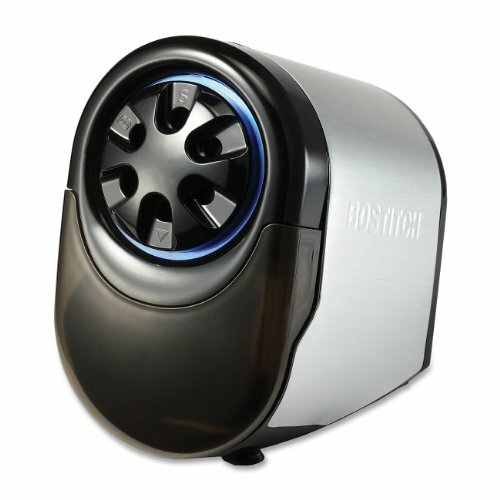 The Bostitch QuietSharp Glow is a great uncompromising workhorse of a pencil sharpener that won’t falter under the pressure of sharpening an entire 170 piece set of colored pencils (thanks in part to its stall-free motor design). This sharpener is backed by a 7-year warranty. Overall, if you want something that will last a lifetime and can swap out a blade when it gets a bit dull – go with the Bostitch QuietSharp Glow. It’s trusted in classrooms and studios due to its industrial design and performance. Now normally when something is only powered by batteries, the performance is never as good as it’s corded counterpart. Sure, the first couple of uses are passable, but after about a week the batteries begin to slowly drain, and the performance slows to a crawl. 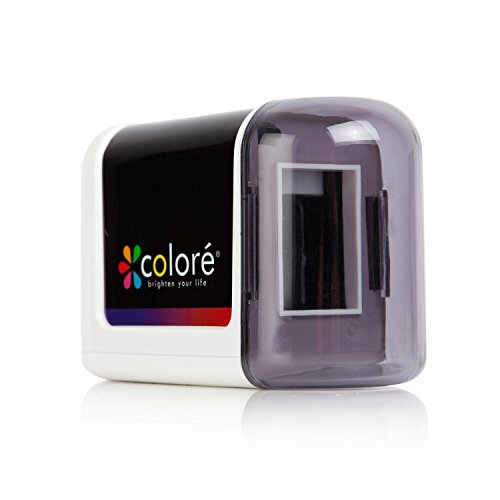 While this seems to be true in most gadgets out there – when it comes the Colore electric sharpener, that is anything but the case. When researching this sharpener, we kept seeing images time and time again of fellow artists sharpening all sorts of colored pencils (Prismacolor, Caran d’Ache, Derwent, Faber Castell, etc.) to a super sharp tip. Of course, this helps to translate to instantly better artwork through precise lines and stroke work in the drawings. It’s through this predictability that we included this sharpener onto our list. Backed by a lifetime guarantee and is widely considered one of the safest sharpeners for kids – this electric sharpener makes sense for artists both old and young. Powered through 4 AA batteries, it should easily sharpen an entire set of colored pencils without faltering. At just under $15 (at the time of publication), this sharpener was one of the cheapest (yet quality) offerings on the market. Sure, it doesn’t have the tip selector or AC powered option – but it’s got it where it counts – reliable performance. 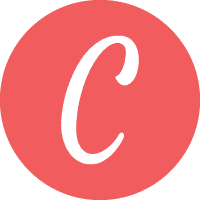 Overall, Colore is a trusted name in the art world. This sharpener is not only reliable, but extremely affordable as well. If you want a no-frills sharpener, get this. Very similar to the EX-20 sharpener that we also looked at, this electric sharpener by OfficeGoods is another perfect home/away sharpener. Designed to be used with graphite, colored pencils, and lead – it can slice through the pencils effortlessly while not chipping or snapping the soft cores found in most colored pencils. As one of the highest rated and reviewed sharpeners we came across in our research – artists have exclaimed that this sharpener provided “a sharp and even point every time” to “did not get clogged” and countless other glowing reviews. Lastly, the OfficeGoods sharpener does have a side dial allowing you to get a point that is either flat, medium, or a fine tip. Overall, this is a great little sharpener that can work with both soft and firmer colored pencil lead types. The power options are great for those artists who find themselves always moving around. Artists loved the EX-20 Electric Pencil Sharpener for a lot of reasons – but one that stood out the most among them all was the power options. One of the most versatile on our list, this electric sharpener can be powered via your standard AC outlet, USB, or through 4 AA batteries. Perfect for road or on your very own art desk, it’s small footprint (5″ x 2″ x 3.5″) also isn’t too terribly imposing. But that still isn’t the half of it! The best feature by far on this electric pencil sharpener is the variable tip setting. Whether you want a rounded tip or one sharpened to a fine point, you can easily dial in your exact preference with the side sharpening options. Lastly, replacement blades…or lack thereof. Unfortunately, you can’t purchase a pair of blades separately, but EcoElectronix does account for this. This sharpener is backed by a Lifetime Warranty. Should it break or ever have an issue, simply contact the company to get your free no-hassle replacement. 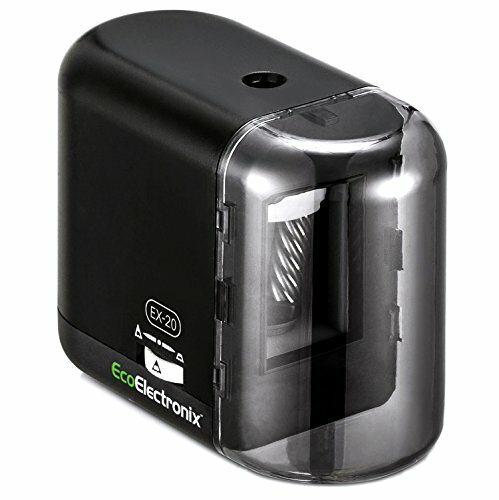 Overall, this is one of the best well rounded electric pencil sharpeners out there. Not only does it have just about everything you need, the price is fairly moderate as well. This cute little sharpener by LINKYO is the perfect fixture for a budding artist’s studio. The top down approach is not only comfortable, but it also ensures that the shavings get cleanly cut away when the colored pencil is being sharpened. Furthermore, the sharpener itself has a few safety and efficiency features built in that make it a great addition to our list. Most notably, we loved the child-safe tray. This safety feature turns off the sharpener when the tray is removed – ensuring no accidents occur to those with wandering hands. 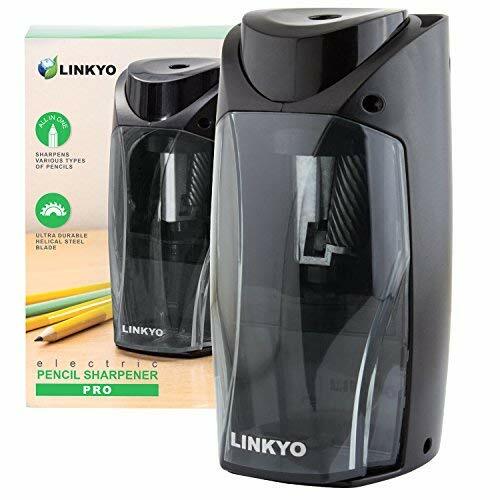 Secondly, this sharpener also automatically turns off once the pencil is sharpened – reducing the risk of over sharpening your pencils and wasting money. The sharpener does come with a 1-year warranty. Overall, it’s a great corded sharpener that gets the job done. The oversized opening allows pencils up to 11mm in diameter to fit in. Expect to get a reliably sharp point. Whether it was when cutting balsam wood or doing any sort of craft that needed precision, just about everyone is familiar with the brand X-ACTO. With nearly a century of experience under their belt – it’s easy to say that they are the experts when it comes to cutting with precision. The XLR Electric Pencil Sharpener carries that same legacy forward. With this no-frills sharpener, the XLR does one thing, and does it reliably good – sharpen colored pencils. 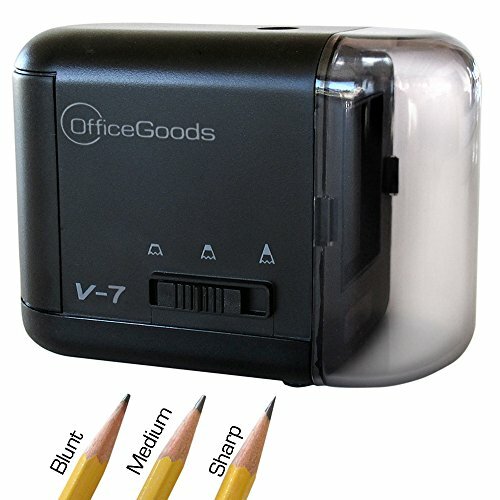 Not only does this sharpener get a super fine point every single time, but the motor itself is incredibly quiet (helps to prevent unwanted distractions), has pencil saving technology baked in (to prevent over sharpening), and child safe operation that prevents the blades from spinning when the tray is open. While this electric sharpener isn’t travel friendly (only operates via an outlet), it’s a great sharpener to have in your studio. This sharpener is backed by a 2-year warranty. Overall, for the price and the performance – if you are looking for a simple no-frills sharpener, get this one. It’s from a trusted brand that delivers where it counts. During our research we saw a few questions pop up time and time again with artists wondering about the safety of electric sharpeners and blade integrity. Is it really ok to sharpen colored pencils in an electric sharpener? Unlike the electric sharpeners of yesteryear that would become dull in only a few months, the electric sharpeners we reviewed above will work well with most colored pencil types. The reason is largely due to both precision and blade sharpness. The blades used in sharpeners today are much sharper and can get a precise and clean cut around the core of the colored pencil without causing any sort of cracking or chipping of the lead (as is often the problem with duller blades). As you have seen in the reviews above, many sharpeners are designed not only for colored pencils, but also graphite pencils as well (which is technically a rock). 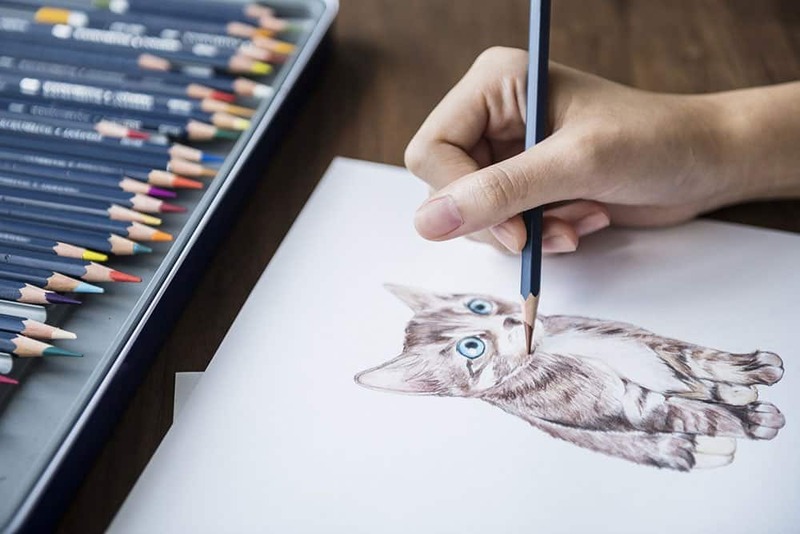 The lead in color pencils is much softer than granite (typically made from either a wax or oily core) and requires a sharper blade rather than brute force in order to get a fine point. Does it matter on the type of electric sharpener I get for my colored pencils? One of the leading problems that electric sharpeners have with colored pencils is clogging (due to the softer lead). Therefore, you will only want to get an electric sharpener that explicitly states that it is okay to use with colored pencils – not following this advice will lead to poor results and likely wasted colored pencils and money. How often do I need to change out the blades for electric sharpeners? This is largely a “your mileage may vary” question. If you are going with an industrial/classroom type of sharpener such as the Bostitch QuietSharp Glow and are using it for only personal use, then it will take years before the blade needs to get replaced. However, if you are an art teacher looking for a new sharpener, then it may only take a few semesters. For the most part though, many of the sharpeners mentioned above should meet the needs of most artists for a few years with heavy use before needing to be replaced. But after several hours of research, looking at pictures of sharpened pencils, and of course hearing what other artists had to say, we feel confident in our list above…and we think you will love any one of them!